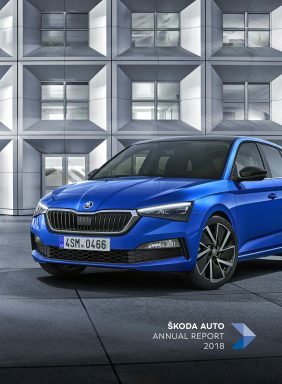 Mladá Boleslav, 7 December 2018 – Around one year ago, ŠKODA AUTO founded a spin-off of its Prague-based think tank, ŠKODA AUTO DigiLab, in the IT hotspot of Israel. As declared in December 2017, the aim was to connect with the local start-up scene and to invest in high tech start-ups as well as joint projects together with joint venture partner and importer, Champion Motors. ŠKODA AUTO DigiLab Israel Ltd now works with 13 start-ups on numerous projects in the areas of artificial intelligence, big data, cybersecurity and vehicle sensor technology. Looking back to 15 December, 2017, in Rudolfinum, Prague: In the prestigious concert and gallery building, the most important classical orchestra in Prague, the Czech Philharmonic, is giving a charity concert in aid of rebuilding the organ of Prague’s St. Vitus Cathedral. Bernhard Maier, CEO of ŠKODA AUTO, and Erez Vigodman, Member of the Administrative Board of the ŠKODA General Importer Champion Motors Israel, are also among the guests. On this evening, the two top managers set the course for strengthening the automotive company’s innovation and development expertise. They sign a letter of intent to found ŠKODA AUTO DigiLab Israel Ltd. The joint venture would become the first spin-off of the ŠKODA AUTO DigiLab in Prague, founded in 2015. January 2018, Tel Aviv. Employees at ŠKODA AUTO DigiLab Israel Ltd start their work, looking for innovative idea generators who want to actively shape the mobility of the future and develop new mobility concepts together with ŠKODA. Hosting more than 6,000 start-ups, around 300 research and development facilities of multinational companies and hundreds of high-tech companies, Israel is one of the world’s largest IT hubs. In total, there are more than 500 start-ups working on the development of technologies for smart mobility and the automotive industry – six times as many as in 2013. The ideal infrastructure for the Czech car manufacturer’s ambitions. May 2018, Tel Aviv. ŠKODA AUTO opens EcoMotion as a co-host. Israel’s largest exhibition for smart mobility is a hub for innovations in the areas of sensor technology, simulation, connectivity, smart navigation, cybersecurity, e-mobility and big data. The team at ŠKODA AUTO DigiLab Israel uses the industry event for further networking with the Israeli start-up ecosystem. The presence of the Minister for Economic Affairs, Eli Cohen, emphasises how important the IT scene is for this small, yet highly advanced country. ŠKODA AUTO DigiLab’s subsidiary enjoys a significant head start in Israel: in conjunction with its parent company, Allied Group, the successful importer of ŠKODA vehicles and models from other VW Group brands, joint venture partner Champion Motors, has top-level expertise and experience in promoting emerging high-tech companies. Champion Motors and Allied Group have extremely good connections to both the IT start-up scene and local venture capital funds. The company has been investing in newly established, innovative enterprises for years, which are now to establish links with ŠKODA AUTO DigiLab Israel Ltd.
Champion Motors lifts ŠKODA AUTO DigiLab Israel right to the top from the very start. The team is based in the 42-storey Champion Tower in the Tel Aviv suburb of Bnei Brak. From a height of up to 160 m, the view stretches over the adjacent Ganei Yehoshua Park, the Ayalon Mall shopping paradise and the river Yarkon. When Tal Brin, CEO of the creativity workshop in Tel Aviv, welcomes a group of technology journalists from all over the world to Tel Aviv in May 2018, the guests quite literally experience the far-sightedness of ŠKODA AUTO DigiLab Israel as the digital experts present technological perspectives in the eleventh-tallest building in Israel. Brin describes how the newly established collaborations produce the best mobility solutions for the future and continue to impress the specialist journalists: just four months after its launch, ŠKODA AUTO DigiLab Israel is working with as many as 10 start-ups and is even in a concrete phase of project development with four of them. They include Guardian, who have developed an all-in-one vehicle sensor, mobility data analysts Otonomo, cybersecurity experts XM Cyber specialising in IT security, and Anagog, who analyse mobility patterns to develop customer-friendly mobility services using this data. July 2018, Tel Aviv. Anagog enjoys a unique position among ŠKODA’s collaboration partners. Firstly, the company that was founded in 2010 has become one of the more experienced in the vibrant start up scene. Secondly, the partnership now goes far beyond collaboration as ŠKODA gets on board by becoming a minority shareholder. 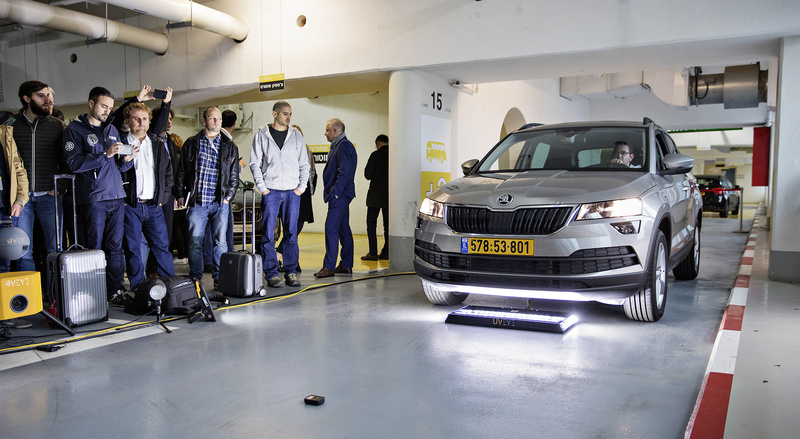 This gives ŠKODA even more direct access to technologies from the high-tech start-up. Together, ŠKODA AUTO CEO Bernhard Maier and Anagog CEO Ofer Tziperman seal the deal on their joint future. ŠKODA AUTO would like to use Anagog’s data analyses to further expand its offering of digital mobility services. Anagog’s key sources of data are smartphones and their installed apps. AI (artificial intelligence) software analyses them in real time, enabling it to predict mobility patterns. This is just as useful for predicting available parking spaces as it is for developing personalised car insurance offered by ŠKODA. Innovation and science go hand in hand. Consequently, in addition to the start-up scene ŠKODA AUTO also seeks close links to the Israeli higher education landscape. Therefore, in July 2018, CEO Bernhard Maier and rector Pavel Mertlík sign a memorandum of understanding with the Coller School of Management. This institute is part of Tel Aviv University, is seen as Israel’s leading business university and is highly regarded all over the world. The purpose of the agreement is for the Coller School of Management to collaborate with the company’s own ŠKODA AUTO University in Mladá Boleslav in future – with a main focus on innovations. 6 December 2018. 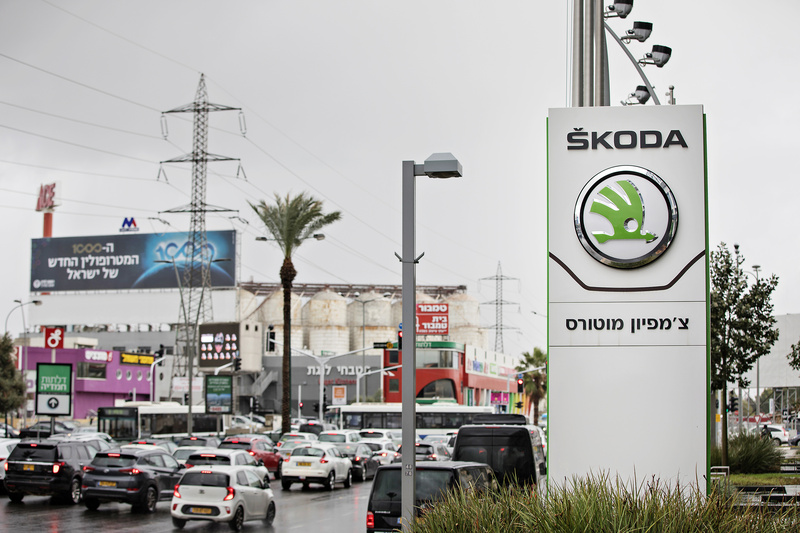 A future-oriented location, a think tank and an important market – Israel is of particular importance to ŠKODA. The Czech brand has been firmly established in Israel since the 1990s. 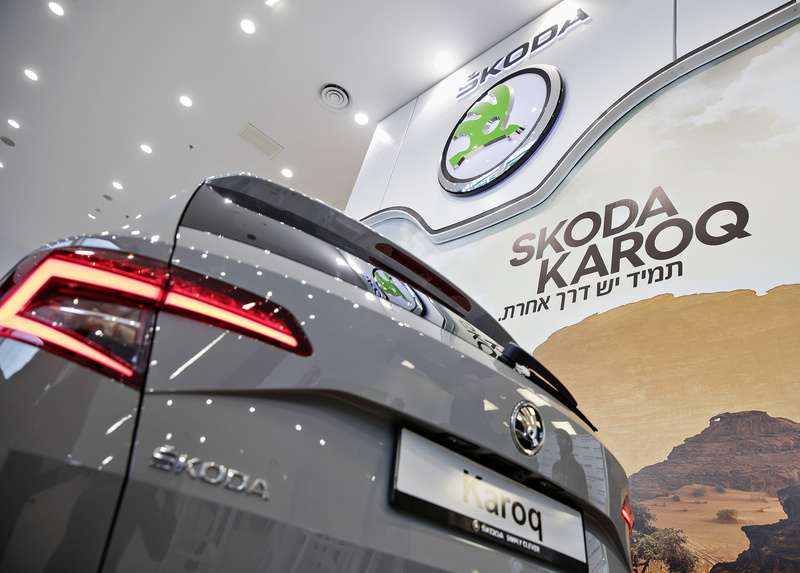 In the meantime, ŠKODA has become the strongest European car manufacturer in Israel. Reason enough to choose the country as the setting for a very special event: ŠKODA is celebrating the world premiere of the groundbreaking SCALA compact model today at the Terminal event centre. With its newcomer, ŠKODA is completely redefining the brand’s offering in the compact car segment. The five-door hatchback combines an emotive design with a high degree of functionality and state of the-art connectivity. 7 December 2018. Immediately after the ŠKODA SCALA’s world premiere, ŠKODA AUTO DigiLab Israel is taking centre stage. At the Digital Event, journalists from all over the world can find out more about DigiLab Israel’s strategy and projects. Two start-ups, who are new to ŠKODA AUTO DigiLab Israel Ltd’s circle of collaboration partners, present their technologies live at the event. Guardian develops sensors based on microwave technology. Mounted on the car’s roof, they detect the smallest of vibrations and movements in the car. This data is processed in real time. 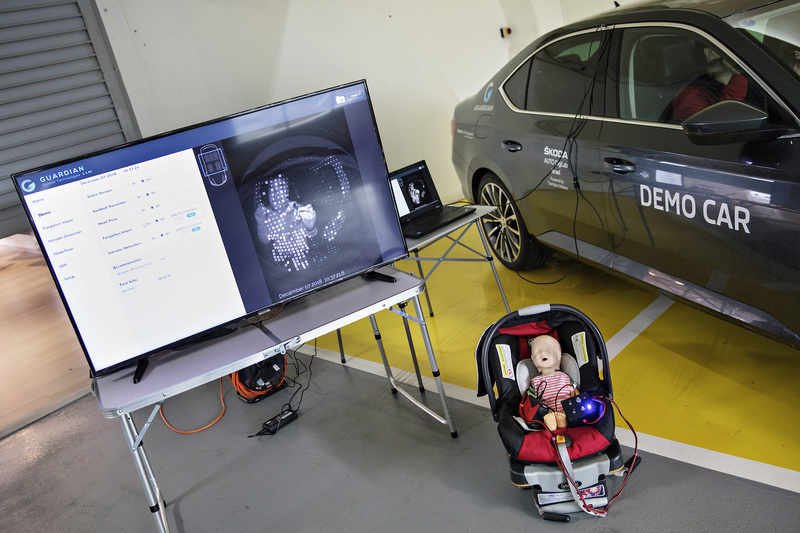 In doing so, the system is able to identify, for example, whether a child seat has not been secured properly or whether a passenger is sitting in a way that puts them at higher risk of injury when an airbag is deployed. If and how occupants respond to these notifications so far remains up to them. The collaboration between ŠKODA AUTO DigiLab Israel Ltd and UVEye could also offer drivers tangible advantages in the future. The start-up’s innovative technology scans the car’s bodywork, underbody and tyres. From the data it collects, the software creates a clear and detailed 3D image in a matter of seconds, allowing it to detect any damage to the car. This solution, which is particularly interesting for dealerships and rental companies when vehicles are returned, is soon to be trialled in the Czech Republic.